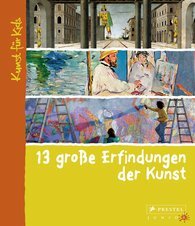 This new volume in the highly successful “13” series uses colorful reproductions, glossaries, and a timeline to explore milestones in the history of art. Kids will learn about important innovations in art while they discover answers to questions such as: Why was oil painting invented? What were the subjects of the first photographs? How do you depict the world on a flat canvas? Filled with accessible, fascinating facts as well as creative suggestions for independent art projects, this unique introduction to art history shows young readers how art is made as well as how to enjoy it.